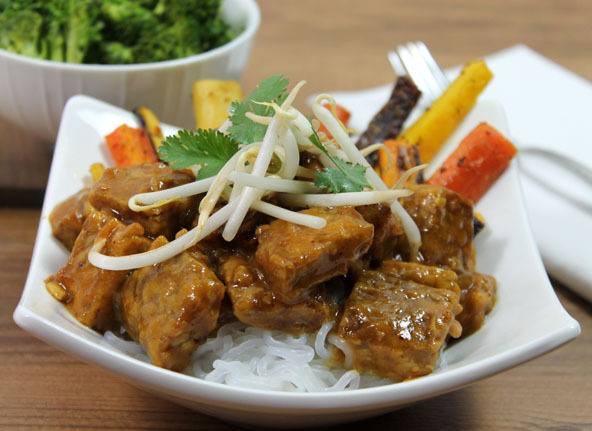 Here’s a well loved Asian recipe made with organic Tempeh boasting 22g of protein per serving. Most recipes call for juicing an orange and then adding in a thickener like cornstarch which is a processed food, I used the whole orange and even 1/2 of a mango instead. The fiber from the fruits thicken the sauce up just fine. I have also used this recipe with honey and maple syrup and they both work equally well. Tempeh is a Wholetarian approved product because it is not considered highly processed like tofu is. Tempeh is made from fermented whole soybeans. You could actually make it in your own kitchen. This site tells you how. I use the Light Life brand, organic soy tempeh. The ingredients are: Cultured organic soybeans, water, lactic acid (from plant sources), organic brown rice. It doesn’t have gluten grains in this one but it is not Gluten-Free. It’s likey processed in a facility with gluten grains. Some are made from barley(contains gluten), millet and flax so check the ingredients as to what suits your needs before you buy. Tempeh does not have a strong taste and like tofu, will absorb the flavors you add to it. I served this dish (see photo above) over Shirataki noodles (see notes below) with roasted multi-colored carrots seasoned with sea salt and Italian seasoning along with steamed broccoli. See my recipe for Shirataki noodles for more info about these amazing gluten-free, grain-free, calorie-free noodles. Add all of the sauce ingredients in a high powered blender. Chop the tempeh up into ¼" x 1" inch pieces. In a sauce pan over medium-high heat, add the coconut oil and tamari sauce. Add the tempeh pieces and turn the pieces over to coat and thoroughly heat it through. Add the sauce from the blender. Coat the tempeh with the sauce and remove from the heat. Serve Orango-Glazed tempeh over shiratake noodles, soba noodles, zucchini noodles, sprouts, stir-fry vegetables etc. Top with mung bean sprouts and cilantro if desired.